Ten years later, the duo of Pino and Ingrid Duran is doing what it set out to do, one bill, one Latina candidate, and one out member of the LGBT community at a time. D&P Creative Strategies, the government relations and public affairs company they built together has been the vehicle for change. The journey they set out upon in 2004 may have started on the steps of the iconic Hilton hotel, but it has landed them on the steps of the US Capitol. 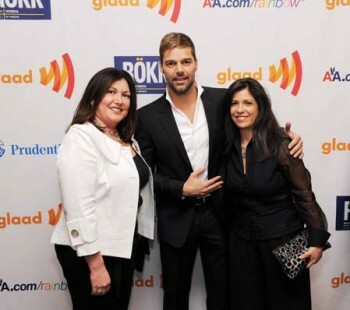 Duran and Pino with Ricky Martin at the GLAAD Media Awards. Both women brought to the venture years of experience and connections, the currency of the relations industry. Duran started in the House of Representatives working for the chairman of the House Banking Committee and as a legislative aid. She was then appointed to President Bill Clinton’s HIV/AIDS advisory committee. 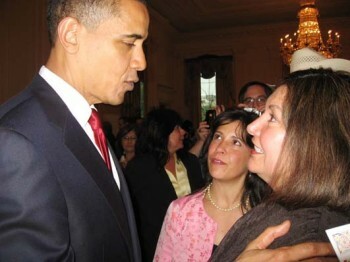 Pino made inroads to the Hill first through her work with Senator Jeff Bingaman, (D-NM) and then as a board member for several LGBT and Hispanic advocacy groups such as the Congressional Hispanic Caucus Institute (CHCI), of which Duran was president and CEO, and the Gay & Lesbian Alliance Against Defamation, on whose board Duran also served. The two met through mutual friends in 1992, but didn’t connect until 2002 when Duran’s CHCI director came back from a conference raving about a Latina who would be perfect to join their board: Catherine Pino. It took two more years before their professional relationship became personal—“We caused quite some scandal here,” Duran jokes about DC—but the women decided to recognize their partnership not only for themselves, but the LGBT community at large. Both women had already come out individually, Pino to her family and Duran while she was in the Marines. “But it was very important for both of us to be role models and be out in a professional and authentic way,” Duran says. As the partners led the way for the LGBT community in Washington, they have helped shepherd another group through their political action committee (PAC), PODER, which they created in 2008 as a first-of-its-kind resource to fund Democratic Latina candidates running for public office. “We want to build a bench of Latinas,” Duran says. “There are only six Latina members of Congress out of 435, and there has never been a Latina senator.” Already the PAC has supported some 30 to 40 candidates, one of whom, Michelle Grisham, defeated an incumbent and a Latino opponent to secure a seat in the House for New Mexico. Duran and Pino with President Obama. On the corporate side, D&P has its biggest political impact through efforts trained on affecting policy. One hot-button issue facing the Latino community and impacting D&P’s technology-based clients such as Microsoft, PG&E, and Comcast, is immigration. Through their lobbying, the women are making the business case for comprehensive reform as other entrepreneurial Hispanic leaders have such as Eva Longoria, their good friend and cofounder of The Harvest (a documentary the exploitation of migrant child agricultural labor). For companies like those D&P are working with, employment candidates qualified in the science, technology, engineer, and math (STEM) fields are severely lacking in the United States, causing them to hire immigrants. With a limited supply—65,000 for fiscal year 2014—of H-1B visas to hire such workers, however, corporations like Microsoft are in an employment pinch. “We work with our clients to make sure they are supporting comprehensive immigration reform, but also that Congress and third party advocates understand the importance of visas and STEM funding to create a pipeline that will impact minority communities,” Pino says. Almost twice as many visas as will be awarded in 2014 were applied for and denied because of a cap on foreign laborers, leaving a void of STEM positions, which non-Hispanic Americans have shown through college enrollment they are not interested in filling. This imbalance, Duran explains, causes corporations to move job overseas to remain competitive. “Ingrid and I have been working on allotment of funds within the immigration bill so that once it is implemented, funds go to states to strengthen their K-12 and university systems, especially in communities of color, so these corporations don’t have to continue looking overseas,” Pino says. The campaign begins with information. Gathered by National Council of La Raza (NCLR), law schools, and various equal rights groups, data showing that more Latinos, especially Catholics, than commonly assumed support equality for the LGBT community. This data is then used to empower Latino leaders to advocate for change, inform Hispanic organizations looking to show their support, and encourage Latinos at the nuclear level to practice acceptance and understanding in their families and communities.